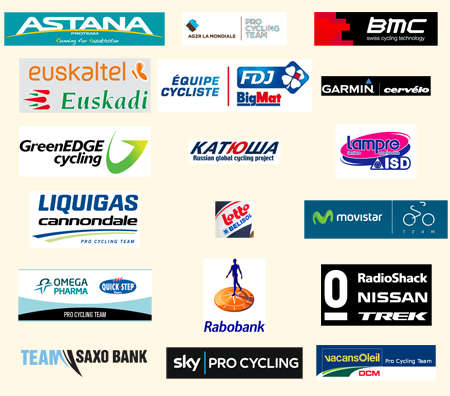 The list of 18 UCI ProTeams for the 2012 season has been finalised today. Announced in several parts over the past few weeks, the list contains 13 teams which were already part of it in 2011, 3 teams which were part of it in 2011 but have changed since due to the game of mergers in the interseason, a team which makes its comeback (FDJ BigMat) and a completely new team, coming from Australia (GreenEDGE). As usual since last year, the sports criterion is the first being assessed by the UCI and this leads to a classification of the international teams which have requested a UCI ProTeam license. On October 25th the UCI published the classification of 20 teams: the first 15 teams have by default qualified for the sports criterion. This criterion is followed by ethical, financial and administrative criteria which have also to be fulfilled in order to pretend to a UCI ProTeam license. Only if all these criteria have been fulfilled, a team has the right to get its license. For the sports criterion, in order, the teams just outside the sure positions of the first 15 were AG2R La Mondiale, Geox-TMC, FDJ (which has become FDJ BigMat since), Euskaltel-Euskadi and Team Europcar. On November 9th the Vacansoleil-DCM Pro Cycling Team (The Netherlands) (until 2013) was added to this list, the confirmation of it's license being submitted to a validation by the license committee. The same day it was also announced that Team Europcar (France)'s request for a license was rejected and that the request from Geox-TMC had been withdrawn by the team due to an unsure situation about its sponsoring. The attribution of a license to RadioShack-Nissan (United States) and to GreenEDGE (Australia) remained to be confirmed by the license committee (audience for the first team on 18 November and for the second one on 16 November) and those teams still had to provide some missing documents, necessary for this validation. Today came the official announcement for those two teams: RadioShack-Nissan (you might have noted that the UCI never talks about RadioShack-Nissan-Trek despite the fact that the team for now at least continues to communicate this extremely long name even though it's not valid according to the UCI rules which indicate that only two brands can be used for the name of a team) obtains a license for only this year and GreenEDGE for 2012 and 2013. What does a UCI ProTeam license mean? As a reminder, the first division cycling teams are called UCI ProTeams (even though the UCI mentions in its rules, in §3 and more specifically in article 2.15.009, a UCI WorldTour Team license), and they can thanks to this license participate in all races of the UCI WorldTour calendar (where they're invited by default and are obliged to participate). Furthermore, they can, if invited, participate in UCI Europe Tour races classed 1.HC or 2.HC (maximum 70% of the participating teams in such a race) or classed 1.1 or 2.1 (maximum 50% of the participating teams in such a race), in races of the UCI America Tour, UCI Asia Tour, UCI Oceania Tour or UCI Africa Tour classed 1.HC, 2.HC, 1.1 or 2.1 (maximum 50% of the participating teams in such a race). What is the result of seven plus two ?